Karnataka is a leading state in terms of industrial growth in India. It is the hub of the IT industry in the country. The technology cluster in Karnataka ranks as the fourth largest in the world. The state has 47 IT and ITeS SEZs, several regions dedicated to IT investment, and three software technology parks. Apart from the IT industry, the state also has sector-specific SEZs dedicated for other major industries. Karnataka’s flora and fauna along with a natural coastline of 320 km provide its tourism industry a major boost. Here is a snapshot of Karnataka industry and its growth. 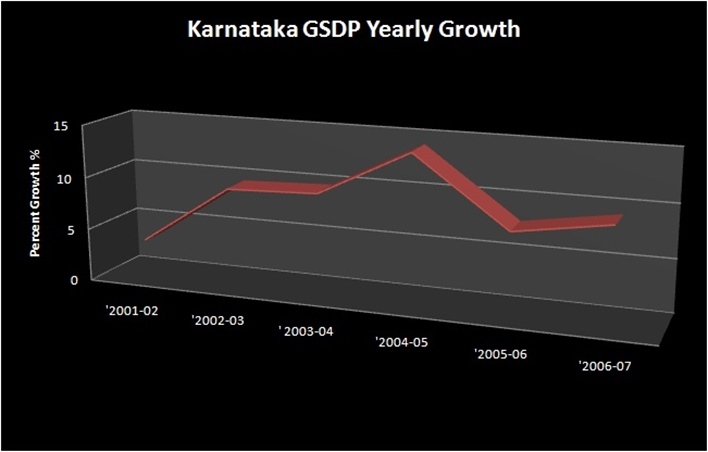 Karnataka occupies its position among the high economic growth states of India. In the year 2015-16, Karnataka contributed 7.54% to GSDP of India. The state’s GSDP was 156.23 billion US dollars. During the period between 2004 and 2016, the state’s GSDP increased at a rate of 13.93% and reached 156.23 US dollars. The NSDP increased at a compound annual growth rate of 14.19% and reached 142.9 billion US dollars. The per capita GSDP grew at rate of 12.91% and reached 2557 US dollars. The growth rates indicated are compound annual growth rate. Karnataka is a land rich in natural resources. Its policy incentives and infrastructure play a significant role in attracting investments for the various industrial sectors in the state. As per the data released by the Department of Industrial Policy and Promotion (DIPP), Karnataka has attracted FDI equity inflows amounting to 20.24 billion US dollars during the time frame of April 2000 to March 2016. Superior manpower: Karnataka boasts of trained human resource in the streams of basic science, engineering, and management. Good communication facilities: The communication facilities in the state are of the first-rate. The state is connected through airports, national highways, broad gauge railway, and sea ports. Mobilize funds worth about INR 2,000 crores. Under the Karnataka Industrial Policy, 2014-19, the state has come up with a number of fiscal and policy incentives for businesses. A SEZ around 300 acre has been formed in Belgaum in order to create a precision engineering and manufacturing supply chain ecosystem. This will be quite beneficial for the manufacturing industries. The State Government has created several organizations and Institutions to provide infrastructural support to the private sector enterprises. The Directorate of Industries and Commerce co-ordinates all activities required for industrial development. It allots to the entrepreneur, power, land and water besides sanction of fiscal incentives. Karnataka Industrial Area Development Board (kiadb.com is not active anymore) acquires tracts of land for development into industrial sites. The Technical Consultancy Services Organisation of Karnataka offers expert consultancy services to small entrepreneurs at moderate rates. The Karnataka State Finance Corporation, Industrial Investment Development Corporation, Small Scale Industries Development Corporation and Karnataka Electronics Corporation provide them finance, equity participation, factory sheds and raw material supplies. Karnataka has got 123 associations representing various trade, banking and industrial organisations. Prominent among the manufacturers association are Karnataka State Small Scale Industries Association, Confederation of Electronic Industries of Karnataka and Peenya Industries Association. All the 123 associations are affiliated to a parent : Federation of Karnataka Chambers of Commerce and Industries (FKCCI). Foreign investment approved in Karnataka during 1993-94 brought about 169 foreign investors from Germany, Japan, USA, UK, Switzerland and Sweden. They have invested in computer software, telecommunications equipment, electronics and electrical, machine tools and engineering products, medical and laboratory equipment, minerals, ceramics, chemicals, leather products, food processing and tourism.